Sheffield Teaching Hospitals and the University of Sheffield, in partnership, are to be designated an NIHR-Biomedical Research Centre (BRC), with the theme of ‘Translational Neuroscience for Chronic Neurological Disorders’. The translational pipeline from basic science through to phase 3 clinical trials for ALS has just been strengthened in the UK with the September announcement that Sheffield Teaching Hospitals and the University of Sheffield, in partnership, are to be designated an NIHR-Biomedical Research Centre (BRC), with the theme of ‘Translational Neuroscience for Chronic Neurological Disorders’. This designation as 1 of 20 BRCs in the UK comes with a seeding award of over £4 million to kick-start experimental medicine and early phase clinical trials in the areas of Neurodegeneration, Neuroinflammation and Cerebrovascular disease. Within the new Sheffield BRC, ongoing MND research will be supported by underlying and expanding research infrastructures in Advanced Medical Imaging, Genomic Medicine and Bioinformatics, and in silico medicine. 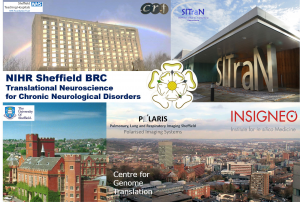 Thus in conjunction with the Sheffield Institute for Translational Neuroscience (SITraN) and the Institute for in silico medicine (INSIGNEO), the BRC formally brings together outstanding researchers from both the Departments of Engineering, and Neuroscience, the recently formed Centre for Genome Translation, with hospital based Academic Units of Neurology, Radiology and NIHR-Clinical Research Facilities. Professor Dame Pamela Shaw speaking as the Director of the new Sheffield BRC said that, “The philosophy of having clinicians and multidisciplinary teams of different scientists working collaboratively has been very deliberate since the inception of SITraN.” This major strategic investment in embedding partnerships across scientific disciplines with clinical practice, for the common goal of improving patient’s lives and reaching towards therapies which slow disease progression is a huge boost to clinical neuroscience research. In Sheffield, specific aims to develop biomarkers for MND, genetically stratify the disease and to take a ground breaking gene therapy for MND into phase 1 clinical trials are planned out for the 5-year funding cycle. The recognition of Sheffield’s world standing as an MND centre will act to attract further funding and researchers from around the world. The Sheffield BRC aims to make positive impacts for patients with neurological disorders and accelerate MND research in Europe, together with the ENCALS partners.